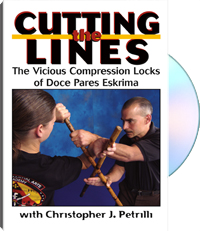 In his best-selling video set Crashing the Lines, 8th degree Doce Pares eskrima black belt Christopher Petrilli taught you an unbeatable stick fighting system that went way beyond anything previously captured on video. Building on the information presented in that earlier effort, Cutting the Lines goes into greater detail, showing you a new series of locks, throws and chokes that will give you the upper hand no matter where you may find yourself in the thick of a fight. A former U.S. Army Ranger, Christopher Petrilli studied Doce Pares eskrima under the legendary Grandmaster Ciriaco "Cacoy" Cañete. He is also an expert practitioner of Indonesian pentjak silat and Japanese aikido.